If you listen to the tech media, they’d have you believe that the tech companies positioning themselves to go public today are as financially weak as those from the tech bubble of 1999/2000. Curious? 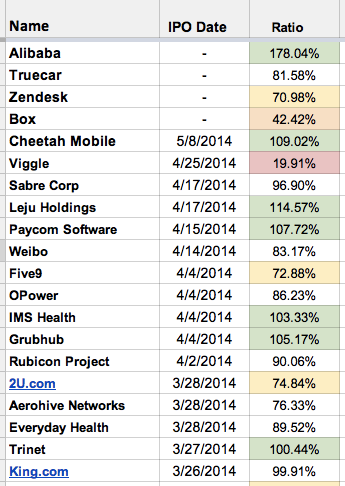 Scroll to the bottom of this post to see data on all tech company IPOs that have taken place since 1997. We were curious to see what we could uncover using data, and have conducted an analysis evaluating the all technology companies to IPO from 1997 to present. 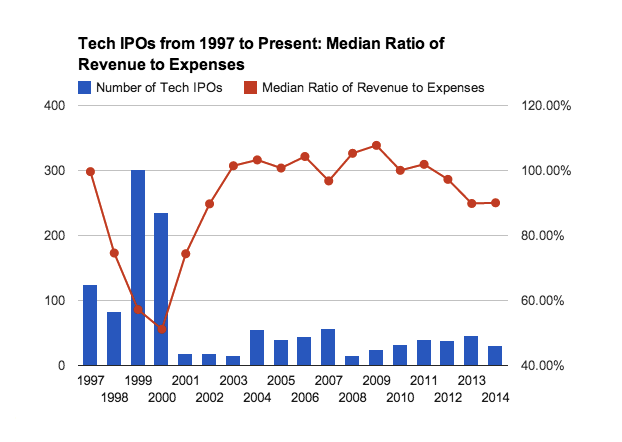 This graph describes two things: the blue columns represent the number of tech IPOs priced by year, and the red line indicates the median percentage of expenses covered by revenue (100% or greater means the company was profitable at IPO). The volume of technology IPOs is nowhere near the frenzied pace of 1999/2000, although at 4 months into the year we’re certainly on track for the most activity we’ve seen in awhile if momentum holds. In 2012 the ratio of revenue to expenses slipped below profitable on the median, and has remained below 100% since then. 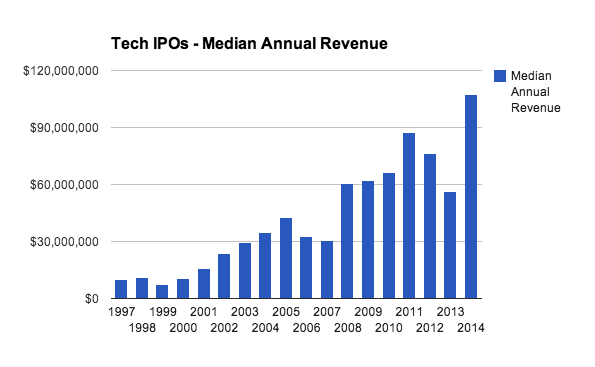 However, profitable IPOs still make up a far greater portion now than they did during the Bubble years. Profitability is more than a box to check. In the face of uncertain access to future capital (e.g. if interest rates begin to climb) a company whose board wants to control its own destiny has to plan ahead. Often this means reducing expenses slowly now, rather than being forced to cut them dramatically through layoffs or other cost cutting if the worst case scenario comes to pass. In the case of Box and Zendesk, two late-stage SaaS startups who have received tepid responses to their IPO filings in recent weeks, the question of whether these companies can sustain themselves without additional cash infusions, and grow fast enough to justify the risk public market investors will be taking, looms large. Even more concerning may be the recent IPO of web entertainment marketing platform Viggle ($VGGL) which filed and managed to go public with just 20% of expenses covered by revenue ($9.3M in revenue on $47M in expenses). Trading began on April 25th at the low end of the target price range, and the company saw its market cap more than cut in half from $125M to $55M in the weeks following. Another recent IPO of questionable financial viability is Castlight Health ($CSLT) who, with a revenue to expenses ratio of just 17% ($12M of revenue on $75M in expenses for the previous year), raised discussion of a bubble among tech stocks back in March. So… Is There A Bubble? Private Equity & Late Stage VC: Possibly. From what I’ve seen, private equity is much more likely to pay up for hot companies to help them bridge the gap between their most recent venture round and IPO readiness. They often pay higher prices due to heavy competition for a small number of qualified deals, but it is worth noting that PE terms can look a lot like a watered down buyout… especially when the expect IPO doesn’t materialize. Venture Capital: Nope. Traditional venture capital deals are holding steady for traditional Series A through D, with a small set of outliers successfully negotiating for more favorable ownership or outsized rounds in the last quarter. Some VCs are simply sitting out on deals they expect will be over-priced. Angel Investors & Seed Funds: Possibly. 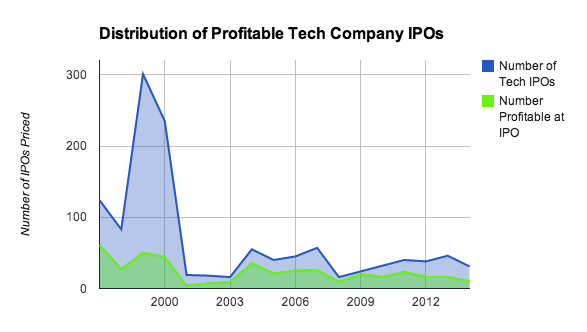 As the post-Facebook IPO angel investments begin to fly or die, while we see the volume of angel investing decrease? For those pre Series A stage companies who do have revenue, particularly the B2B SaaS variety, is there an institutional round in their future, a slow zombie-like decline, or will they grow under their own revenue streams without the help of additional outside capital until much later, if at all? Competition for hot and featured deals on AngelList and deal flow from Y Combinator drives up valuations for those few hundred companies… but with more seed stage startups at the top of the funnel than ever before it seems unlikely that every angel investor will come out a winner.